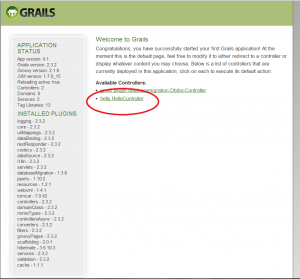 Grails is a framework that uses the advantages of Groovy, a dynamic type language which is almost a superset of Java, and the principle of “convention over configuration” in order to supply a very easy to use and quick to develop web-applications. It relies on the JVM and Spring as well as some other technologies that are out of scope for this post (Hibernate, templates etc). MVC stands for Model-View-Controller, which separates concerns and thus eliminates dependencies between the data (model), display (view) and business logic (controller). The controller is the entry point to the app, the HTTP request is dispatched to the relevant controller which drive the data from the Model, and might process it using one or more of the Service classes and will choose the proper View for display. The View doesn’t have to be strictly “display” it could also be JSON/XML or any other representation of the data. In the rest of this post we’ll create the helloworld example and run it – with one major added value: I’ll help you avoid the pitfalls that I ran into. Ready ? 3. update the PATH variable to PATH="$PATH:$GRAILS_HOME/bin"
Lets get in by typing cd hello and create our first controller. Can you guess the command ? if you missed this one – don’t be upset, you’ll get the next one. Hey! that’s not a nice thing to do! you should see the link to the controller that prints “Hello World! and once you’ll click the controller-link, you’ll receive a sweet “Hello World!” in Grails.